The Hindu community located all over the globe celebrates Deepavali, the annual festival of lights, with great pomp and ceremony. In Malaysia, where almost 8% of the population follows the Hindu faith, Deepavali is a rather grand celebration. The day of the festival its self is declared as a public holiday in all of Malaysia (except Sarawak) and festivities commemorating the fete, which honors the triumph of good over evil commence almost a month before the actual day. Celebrations for Deepavali in Malaysia kick-off way in advance in the form of various sparkling, goodie-filled Deepavali Bazaars which are set up within the many Indian enclaves around the country, like the area of Brickfields in Kuala Lumpur. On offer at these bazaars, are delightful Deepavali decorations (lamps, garlands, buntings and more), festive Indian apparel, Indian sweets and eats like ladus, vadai, ommapadi and the much-loved murukku, all of which are immensely popular with the local Malaysian populace. Dance performances and Kolam (Rangoli) competitions also feature at the bazaars. 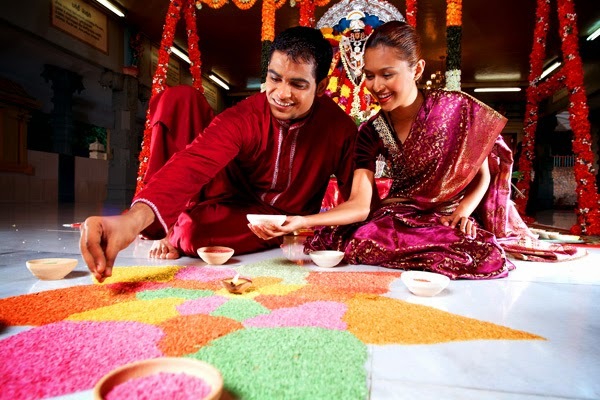 A unique aspect of Deepavali celebrations in Malaysia is the concept of ‘Open House’ as Malaysian Hindus invite their friends of various religions and races to participate in their Deepavali festivities. This practice helps promote much camaraderie and harmony in a multi-racial society like Malaysia. The rest of the day is spent in much revelry and festivities. However, Deepavali celebrations are not just limited to Malaysian Hindu households for even hotels and restaurants are elaborately decorated for Deepavali and host ‘Open Houses’. So if you are mulling about getting away from India for Deepavali 2014, why not consider a getaway to fascinating Malaysia? You will have a bouquet of delights to discover, without loosing out on any Deepavali festive spirit.